Are you ready for some Divine DeNami Designs Inspiration? a mini DeNami Shopping Spree! I used a small Kraft Coffee Bag. patterned paper, twine and a button! I used a lot of DeNami Goodness today! from the Autumn Stamp set. create a background for the front of my coffee bag. finished off with a Tangerine Boutique Button. how about a fabulous host? This is such a great gift. I love scented candles myself, who doesn't? Great job! this is beautiful! you've just made a wonderful gift a phenomenal one...your stamping is perfect and the strip, tag and twine are the perfect finishing touches! love it! Okay, I am totally in love with your coffee bag. Your stamping is so beautiful, Tammy! Mmmmm...I can imagine how good that candle must smell (I love salty caramels--yummy!). So so so love this!!!!! Man....soooooo creative Miss Tammy!!! Thanks for sharing!!!! Super fun gift bag! Love the idea, love the way you decorated, love it!! What a great gift bag! I love that you can see through the window! and you did a great job in decorating the bag showcasing lots of DeNami goodness! 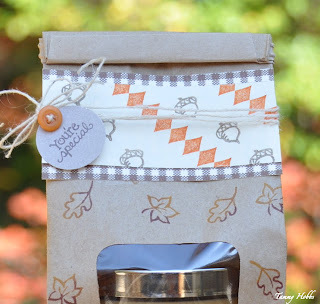 Such a good idea, to decorate a coffee bag, Tammy! It is so cute. And I have to say that candle looks absolutely delicious to smell; haven't tested that one yet! This is so fun! Great work on stamping the bag and the pretty decorations for it! Yum! I can almost smell your candle! What a great way to do some gift giving! wow this is so awesome... I LOVE IT..what a great way to gift a candle...thanks for sharing.. Gorgeous!!! I love the Autumn Set. Love the inking on the leaves and that acorn is too, too cute!! LOVE LOVE LOVE this gift bag, Tammy!!! It's SOOOO TOTALLY GORGEOUS!! The decorative strip at the top, the way you stamped out the leaves, the twine and sweet little tag----beautiful combination!!!! What a great gift and such a great job you did with the gift bag, just beautiful! Tammy, I'm in awe of this gift bag! So many details make for one fantastic design. Really like your autumn color choices! Tammy this is SO cute! I love what you did with the stamped leaves -- they look just fabulous! Thanks for sharing! Tammy - this is such a clever idea :) I love how versatile it is. very nice gift idea.. I love the verigated leaves.. super cute! Such a great gift idea. Love that bag. I will have to look for those. I love the stamps you chose for this project. This is really lovely! Anyone would be so lucky to get a gift like that. The bag looks fantastic! Love the fall feel of your bag! Oh what a lovely bag!!! Great idea! Thanks for sharing! Have a Happy ThankXgiving!! Love how the coffee bag gives a little sneaky peek to whats inside! I'm seriously with Wendy...love the little peek you get at the goodie inside! Never saw the kraft coffee bags before...seriously wanting some. What an adorable project you made! This is so fun! Great work! Thanks for playing along. SOOOO cool! I love that you reused a coffe bag! I'm going to have to try this for sure!!!! The stamping on these bags is awesome! Love how you finished off the packaging with a button + twine. Tammy, LOVE the see through window on this gift bag and all your FAB stamping! LOVE the harlequin, and acorns and leaves! LOVE the twine and button! FAB project! LOVE LOVE LOVE it. Wish someone would make one for me.....great idea. Love the coffee bag. Great work! That is a fabulous gift bag. You absolutely hit the mark on it. Such a sweet gift bag - love Starbuck's hot chocolates, too! Also love the fall theme to your bag. Oh my.....this is a work of art, Tammy! 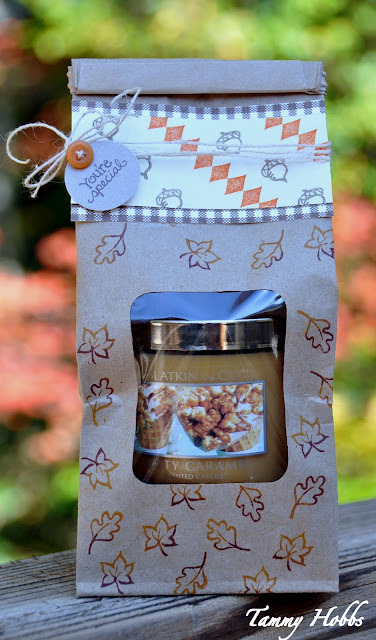 I'd *almost* say that the bag is just as great as the gift- however, I'm a sucker for Fall candle scents. ;) Love all the stamps you used on this bag- they work so great together! This bag is amazing!! I love the way you've decorated it with stamps. What a super way to package your candle, Tammy! !